What tips and tricks have we picked up along the way? If you are planning a roadtrip of more than 3 months then you might consider buying and reselling a motorhome for the trip rather than hiring one. Although there are no guarantees, most people report that they only drop a few thousand dollars by doing this. It is a lot cheaper than hiring a van/motorhome and certainly cheaper than other holiday options eg B&B with hire car. So presuming you will be purchasing your 'new home' for the next 12 months, as in our case, the following tips and tricks might be handy for you to know. you cannot be in any country that is party to the Schengen Agreement for more than 90 days in any 180 day period. Downunder insurance WILL insure Australians that have bought motorhomes in UK without satisfying the criteria above BUT they charge quite a lot for this. Fair enough though, as they are virtualy the only company that will! Hertsinsurance will also consider insuring you but they require you to ring them in the UK ie they assume you are already in the UK. take with you extra passport sized photos, copy of your planned itinerary, proof of your abiity to support yourself eg credit card limit, in case you need to apply for visas. If you are retired you don't need proof of income. You can apply for Turkey visa online but only 3 months before you go there OR get a sticker visa at point of entry. You can apply for the Russian visa online up to a certain point and then need to print and take it in person to an Embassy. Tell your banks and credit card suppliers when and where you are going so they don't put a stop on suspicious transactions that are really you! Join a caravan club if you intend staying in caravan parks and this will get you an identification card that can be left with caravan parks rather than leaving your passport. buy mobile telephone (cell, handy) sim cards in countries you are visiting for a period of time, as it is much cheaper than using 'roaming' on your own country's mobile. Check your phone is 'unlocked' before you go so you can use any sim card in it. get a 'Translate' app on your phone, that works offline, and download the languages you will need - you don't always have wifi. We have a SatNav affectionately known as 'tommy' when we are not abusing it for taking us on some strange shortcuts! Seriously, we couldn't do without it. BUT we also have a hardcopy map book which is also invaluable. The AA ' Big Road Atlas Europe' is also essential for a trip like this. The towns especially interesting for tourists are marked in yellow boxes and there are icons representing the most important things in the areas you are passing through eg castle ruins or palaces or churches or scenic cliffs or nice swimming beaches etc etc etc. This helps us decide which roads to take and towns to visit. Then 'tommy' gets us there. We try not to travel on major motorways too often as you don't see enough of the country you are travelling through and miss out on those small discoveries that make the trip so much more memorable. take small 'Australian Flags' to stick to your van windows so people know who you are. We bought a few 10 x 20 cm material ones from a cheap shop around Australia Day. Take some 'Blutack' and attach wherever they fit! Everyone seems to have a relative or friend in Australia and they like to tell you about it. People like to strike up a conversation with us if they know some English. The locals and other campers are usually very helpful, telling us about great places to see in the local area. We also bought 'Australia Flag' beach towels which are small - better to dry faster in the camper. A windscreen size Australian flag (also from the cheap shop), with 2 elastic loops sewn at each end, go over our visors at night to offer a bit more privacy but also to make sure people know we are Australians. For some reason people seem to like Australians so why not make use of that. Well we picked up a few pearls of wisdom on our two round Australia road trips. Especially the first one which was a bit different back then as we didn't take a caravan. It was mostly tenting or the occasional motel or on-site van. Also, we had 3 kids (6,8,10 years) travelling with us. We registered the kids for Distance Educaton which we can highly recommend. They only did two formal subjects (Maths & Language Skills) and picked up the rest just from the trip itself. the more recent one was without kids but with another couple (Karen & Gary) who have their own car and van. So what are we doing differently? For starters, this time we have worked out we need longer (6 - 7 months) and the kids (much older now) will have to fend for themselves at home! It's good to have a plan but don't be tied down to anything. Be flexible! There is usually no need to book ahead so long as you arrive by 4pm - Broome is one exception!. If you are passing through a popular tourist destination and it is school holiday time then that is a different story. So be aware of school holiday dates in each state. Another exception worth noting is Lawn Hill Gorge (QLD). There are strict limits on numbers and so often you need to book months in advance for the campground. Another great place you need to book ahead is for overnight stays at the lighthouse on Wilson's Promontory. See the accommodation page for more information. For great maps all around Australia with marked camping areas ranging from Free Camps to reasonably priced Caravan Parks and National Parks it is worth buying a copy of this book. Camps Australia - The ultimate guide for the budget conscious traveller. We referred to our copy every day of our round Australia trip. Make sure you talk to people at each place you stay as they are the best source of information. You hear about great places to visit and places to avoid. Some of the best places are off the beaten track and so you may not read about them in tourist brochures. If you have already done this type of trip around Australia, please send us your 'tips n tricks' and we will place the best here for the benefit of other readers. 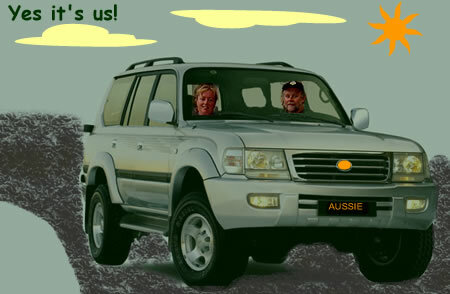 Cherie writes: Hi I've just come back from a trip to Alice springs on pretty rough roads. Talking to the guys at MountDare they say they recently had 4 late model Holden Dual Cabs with the front towers of the shockers breaking - something to watch out for??? Holidays can be stressful for families traveling with children. Although true, saying that children have a short attention span can be such an understatement. Is there ever a more ideal time to prove this than the holidays when you are traveling with kids? The constant demand for attention can drive you crazy, and be a trip spoiler. This post will give parents some much needed tips to help maintain their sanity and have a relaxing holiday while traveling with their kids. The solution to your problems starts with your packing. Children are naturally active and inquisitive and will certainly get bored easily, but when they have something that occupies their hands they stay entertained for longer. Pack the game bag and establish a rule that the bag will not be opened until 30 minutes into the journey. You want them to be settled and also need to extend the occupation for as long into the journey as possible. Pack items such as crayons and coloring books for younger children. To help avoid children spilling crayons and a screaming child who wants to go after them, pack them in a plastic container instead of taking the box. The container or something like a Ziploc bag will be easier to handle for little hands. Books with flaps and sensory books are also excellent pieces to take along. They will keep the child occupied as they try to master opening and closing them. For kids who can write, you could pack paper and pencil for them to write on. They can occupy their time for a bit making a list of the cool things they want to do when they get to their destination. Whatever writing activity you give should be engaging, so they have something that causes them to think. Magnetic drawing boards such as the Magna Doodle as well as a glow board will also keep children occupied for some time. The Magna Doodle leaves no mess as you use the pen to draw and then wipe it clean. The child can draw pictures then use the accompanying shapes to make the picture more interesting. A glow board comes with its own special crayons of varying vibrant colors that children love. These pieces should keep the child occupied for some time as well. If you hire a car you'd want to hire one that carries a screen so the kids can watch cartoons and movie. Kids love these things and rarely ever pass up on them. For older kids, electronic games are always a hit. They get so engrossed that they may end up asking you to get out of their hair. There is a game called license plate lingo that the entire family can join in. This is where the family tests their imagination by trying to come up with meanings for the letters on the license plates they see. 1132 DR could be 1132 Dead Rats and so on. All the games and items mentioned here could serve to entertain a child on the way to the holiday destination and back. To be frank, they could even be used at the destination if things get boring. There is simply no need for you stress yourself with the kids when you have games around. You only need to cover the vents in your van if it is a VERY dusty road (fine dust). With the majority of dirt roads minimal dust comes in through the vents in the door and back of the fridge and it is best to leave them open. If you need to cover the vents then you should not run the fridge while travelling (our fridge runs on DC when travelling). Use heavy plastic taped over the outside - we used some of our old pool liner cut to size which could be reused when necessary. Also put the plug in the sink to stop dust coming up there too. We 'siliconed' and/or taped around any opening to the outside to stop dust (and possibly water) coming in. This included water pipes and wires - look for openings from the fridge area to other cupboards that may allow dust to pass through. We put an 'egg carton' foam mattress layer on top of our van mattress as they typically are too hard and uncomfortable and covered that with a cotton mattress protector to hold it all in place. The left over foam, once we had cut it to size (our mattress is queen-size in length and double-size in width), was used to line the base of cupboards that held items such as cooking pans, toasters etc. This stopped them sliding around and bouncing too much. It also could be cut to wrap neatly around water pipes etc that went to the outside. This effectively acted as a filter for possible dust coming into the van. Have one child each side of the back seat separated by an esky so there is no fighting - definitely need to keep them apart. Decide at the start who will sit where are why and don't consider changing. This eliminates the 'my turn in the front' or 'he had longer on the left side than me' arguments. Buy a roll of the antislip plastic matting to use to line food cupboards etc so things don't slip around when travelling. Try Spotlight stores for a cheap roll of it. Buy Corelle crockery - virtually unbreakable - as it is MUCH nicer than plastic and travels better than china. You can buy wine glasses in sturdy cardboard boxes of two - same with beer glasses. KEEP them in the boxes so they travel well. There is no substitute for glass when drinking wine and beer. [Note: we are still using the same glasses in the same boxes for last 7 years! Clothing Tips - What type of clothes are best? For the great outdoors - you are bound to go on walks or on a boat at some stage. Don't forget good walking boots, thick socks, hat, waterproof spray jacket, light cotton long sleeve shirt to keep the sun off while still keeping you cool - temperature 'cool' that is! And thongs, you definitely can't go anywhere without those Aussie necessities. Remember to use sunscreen wherever you go in Australia - winter and summer - if you are spending time outdoors in the sun.. Temperatures vary greatly across Australia. In desert-type areas eg near Alice Springs (NT) it can get to 30 degrees (Celsius) during the day but drop to 15 degrees overnight. You need both winter and summer clothes in the one day. 'Winter' by Australian standards that is! Unless you are visiting places like the Snowy Mountains or Falls Creek, snow is NOT a consideration. A coat that can be dressed up or dressed down in a colour that goes with anything is very handy for travelling. Make sure it has some pockets for money, camera and a few other necessities so you don't need to carry a bag. What did I actually wear on the round Australia roadtrip? What clothes should I avoid? Avoid WHITE shirts and tops at all costs as they will show every mark, especially if you are camping. You don't need more than one pair of jeans - less is more when travelling and jeans are bulky and take ages to dry when you wash them. When you are on the move and you can't predict the weather this is an important consideration. You can always buy items along the way if you need to, so start off with as few things as you think you can manage with. After a week you will know if there are more items that you need and then you can purchase them as you need them. Do the 'crush test' before packing your clothes and avoid the ones that crush easily. Everyone hates ironing don't they? A handy tip is to make 'hold-it-alls' with many pockets that tie on the back of the front car seats for each child. This keeps all their pens, paper, books and other handy items close by while travelling. We like to cook 3 or 4 meals [eg apricot chicken, a curry, spaghetti bolognese (not the pasta)] and freeze them 2 nights before we go and put them in the caravan freezer. Use old rectangular chinese food containers as they stack well. This saves a lot of cooking on the days when you have long drives. Having frozen meals in the caravan freezer helps to keep it all cold when you are between destinations and don't have the fridge turned on to DC. We keep the basic crockery, cutlery, pans, utensils, bed linens, towels and food items (that store well) in the van at all times ie we have a separate set of everything so we don't need to pack it all each time we go - it is always in the van. After we return from a trip we wash the linens, towels etc and then put it all back and even make the bed up again so you are ready for next trip. We keep our crockery in a slide out plastic box which allows you to pack more stuff on top of the box also ie use it as a shelf. We have a crockery stand & collapsible shelf we put on top of a cupboard when we stop for any length of time. We need to do this as our van 'pops up' from half way ie no cupboards above waist height. Much more convenient accessing plates etc from above waist height and takes no time to set up.